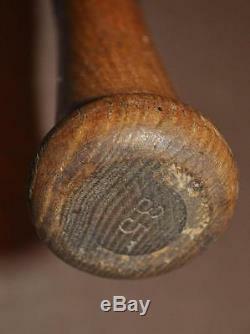 Vintage 20's George Babe Ruth Hillerich & Bradsby Baseball Bat Must See Yankees. Bat is in uncracked with a strong center logo and babe's name is light as seen in pictures. Tape on handle does not appear to be covering a crack but i cant not guarantee it. 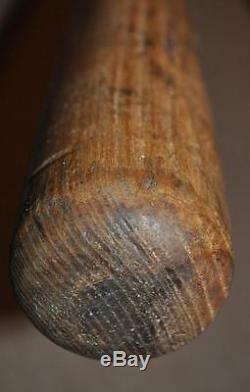 Bat is used with some scars and minor grain separation on back of barrel. Wear as seen in pictures. Would look great in any memorabilia display. Super cool bat that you won't see again for some time, Take advantage of this rare oppurtunity! Let the pictures do the talking on this one and decide condition for yourself! Please review pictures for best description. Please determine condition for yourself. Many other Spalding, Louisville Slugger & Hillerich & Bradsby will be listed in the coming months including Ty cobb, babe ruth, lou gehrig, mushroom knobs and ring bats.. Maybe a decal bat too. Thanks for looking and good luck. Get Images that Make Supersized Seem Small. Auctiva's Listing Templates improve your auctions in minutes. Attention Sellers - Get Templates Image Hosting, Scheduling at Auctiva. The item "Vintage 20's George Babe Ruth Hillerich & Bradsby Baseball Bat Must See Yankees" is in sale since Thursday, January 19, 2017. This item is in the category "Sports Mem, Cards & Fan Shop\Vintage Sports Memorabilia\Bats". The seller is "mghpro" and is located in Brick, New Jersey. This item can be shipped to United States.